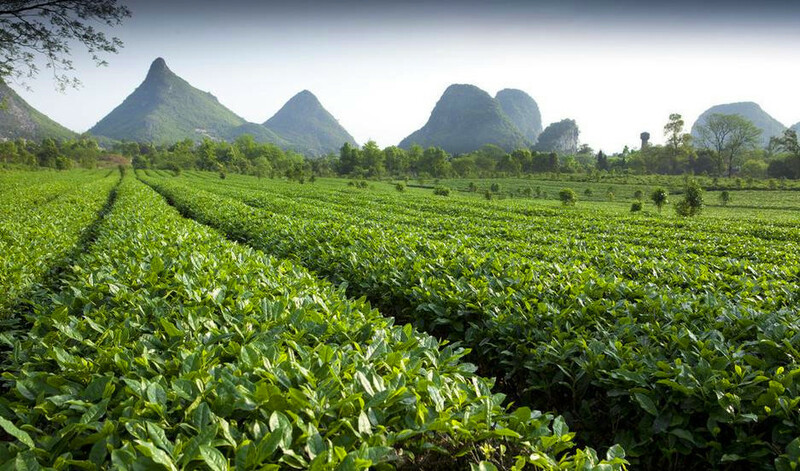 Take this one-day private tour to visit the star attractions - Reed Flute Cave, Fubo Hill, Elephant Trunk Hill, as well as a local tea farm, for an all-sided view of Guilin city. 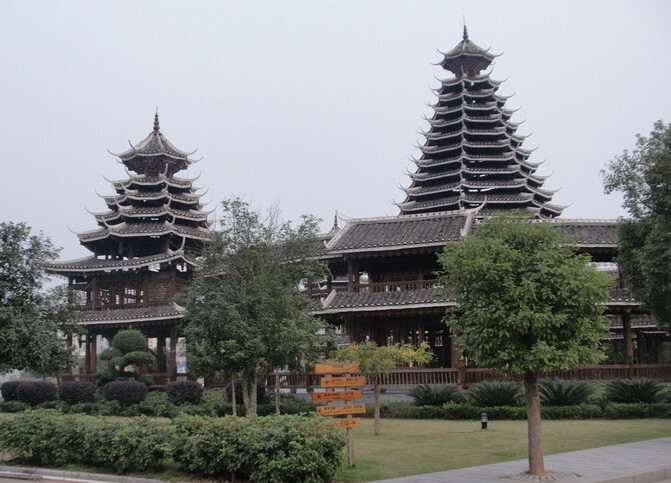 Your private tour guide will meet you at the lobby of your Guilin hotel at your preferred time (usually 08:45 am). 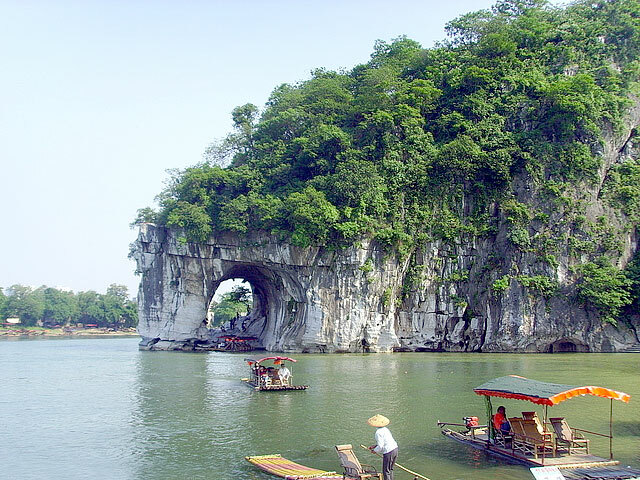 First, transfer to visit the star attractions in downtown Guilin, Elephant Trunk Hill; and Fubo Hill. Both of the two hills standing on the bank of the Li River. Elephant Trunk Hill is the symbol of Guilin city; the hill looks just like an elephant drinking water from the Li River, hence the name. 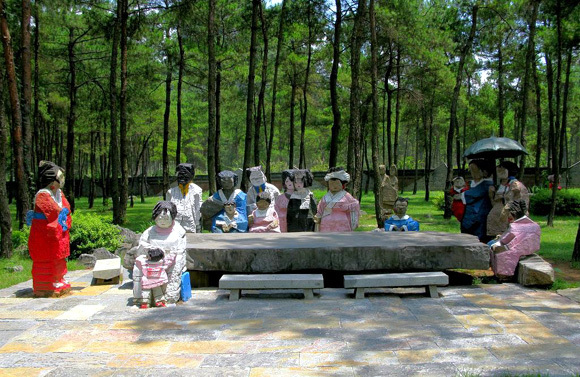 At the foot of Fubo Hill, Thousand-Buddha Cave is a great attraction. It is needed to walk uphill about 30 minutes along the stone steps to the hilltop; then you will be awarded with a good bird's eye view of the whole city. Then, move on to visit Reed Flute Cave – a brilliant cave marked on almost all travel itineraries. Inside this water-eroded cave is a spectacular world of various stalactites, stone pillars and rock formations created by carbonate deposition. 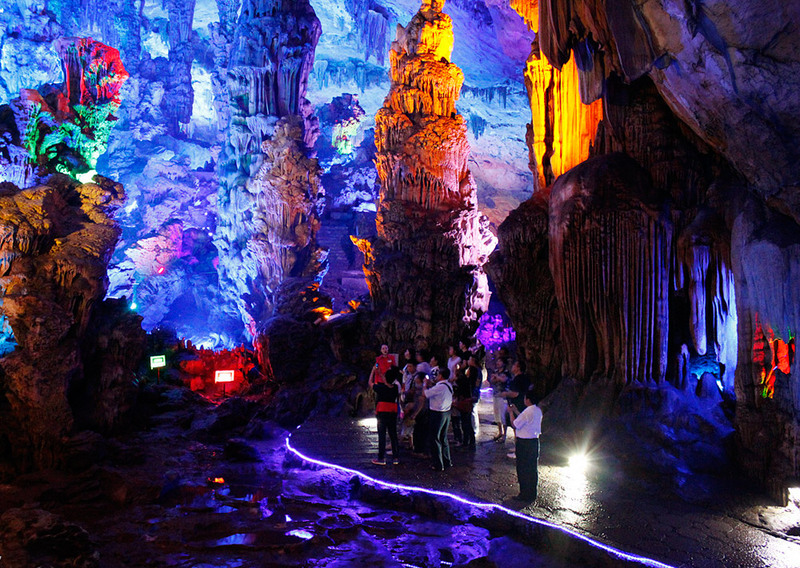 Illuminated by colored lighting, the fantastic spectacle is found in many variations along this 500-meter-long cave. 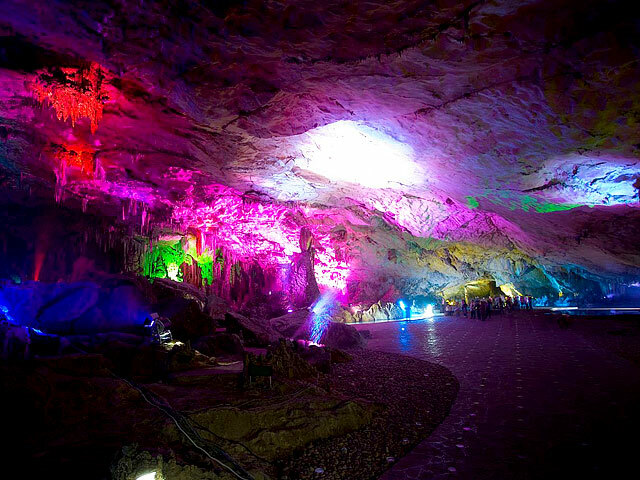 Reed Flute Cave, a huge natural limestone cave. Reed Flute Cave, well-known for its strange stalactite and stalagmite formations. 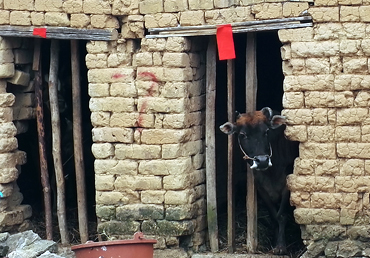 Have lunch in a good local restaurant where you will have a chance to try different tasty Guilin cuisine. After that, drive about 25 minutes to Yao Mountain, which is the highest hill (903.3 meters above sea level) in Guilin city. You can easily get to hilltop within 20 minutes by the 1,416 meters long cableway and get a wonderful view of the peaks and surrounds. 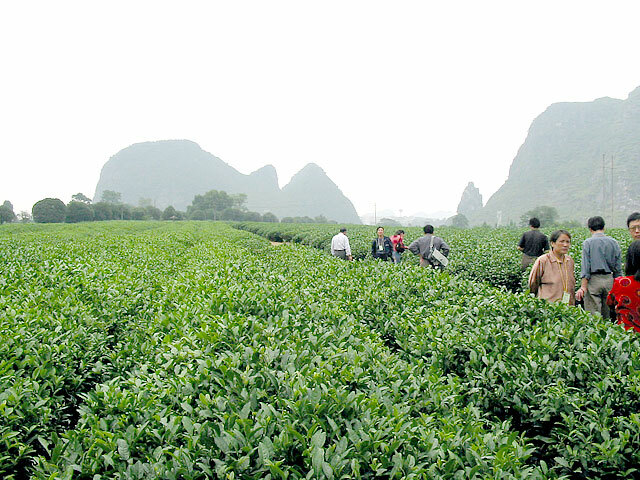 There followed, drive to a nearby organic tea farm – the largest one of its kind in Guilin area; there offers a good chance to have an experience of Chinese tea culture. The hilltop offers a good view of the surroundings. 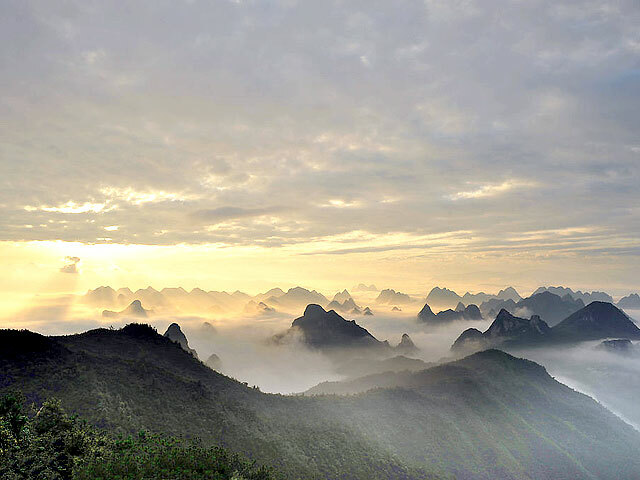 After your visit, transfer back to your Guilin hotel in late afternoon. Chinese lunch in a good local restaurant. Our travel consultant has contacted you via email and glad to know you've booked the trip with us. Wish you a good trip! Hi. I am interested in this.your but my flight arrival is around 10am from the airport. Is it possible to still do this tour. I am staying at Secret Courtyard in Guilin. If it is possible, how much will it cost? Thank you. Thank you for your message. 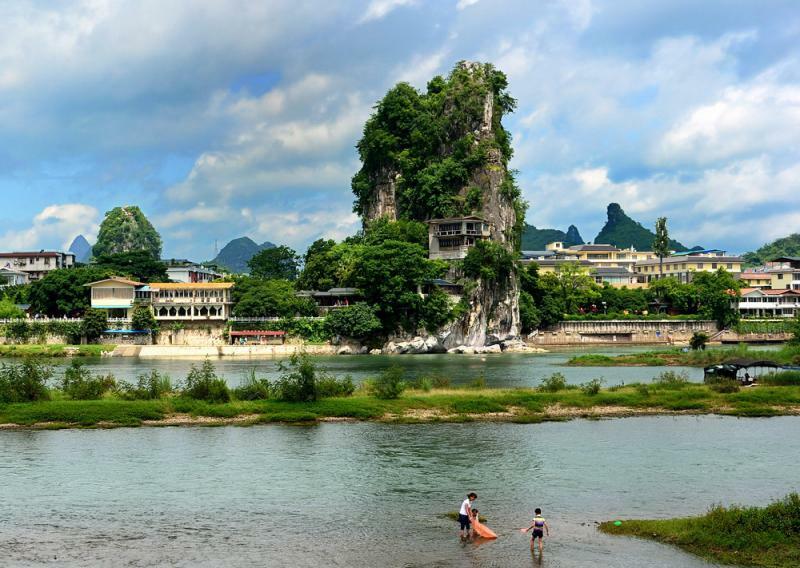 This Guilin city tour is a full day itinerary. If you arrives at arond 10am, you will have an afternoon only for the city tour. Our travel consultant will contact you soon and please advise if you want to take a full day tour or just take a half day tour with less visits. is the time still enough? We are very glad to be of service to your. Regarding the city tour in Guilin, our travel specialist will be in touch with you soon via email. I am interested in doing your local tea farming tour, what is the price for 1 day? I am staying in the centre of Guilin at the moment.